The aftermath of the Paris attacks has seen an even more determined campaign by the media and politicians to scapegoat the Muslim community. While much has been made of Malcolm Turnbull’s “softer” rhetoric, he has done nothing to slap down the rampant Islamophobia of Ministers like Josh Frydenberg. Turnbull’s immediate response to Paris was to push Abbott’s “stop the boats” policies (linking refugees to terrorism) and to sing the praises of Australia’s security agencies. By repeatedly declaring that Muslim leaders are partners in dealing with “extremism”, Turnbull both associates the Islamic religion with terror and tries to make Muslim community leaders take responsibility for government policies that target the Muslim community. Laws to allow control orders for teens as young as 14 will be put to parliament early next year. ASIO chief Greg Moriarty stoked the fear-mongering, telling The Daily Telegraph there are 190 people in Sydney and Melbourne supporting IS. But if ASIO had any real evidence they would be charged under Australia’s anti-terror laws. Turnbull’s Ministers went further, accusing the Grand Mufti of apologising for terrorism because he dared to refer to “causative factors”, including Western wars in the Middle East and Islamophobia at home. Philip Ruddock made an appearance on BuzzFeed to push the myth that refugee families could be terrorists. But no refugees arriving on boats have ever been involved in terrorism in Australia. Tragically, Labor has sided with the worst of the Liberal war-mongers to attack Turnbull from the right, with Shorten declaring that Immigration Minister Peter Dutton should be on the National Security Committee. Shorten also sickeningly approved France’s bombing of Syria, “I hear France has retaliated. Good on them”. Now Turnbull is saying any request for more troops to Iraq and Syria would be “considered constructively”. Turnbull’s hypocrisy and his embrace of Tony Abbott’s policies have also been displayed at the Paris climate summit. On the first day, the Australian government opposed a statement calling for a phase out of subsidies to the fossil fuel industry. Turnbull has adopted Abbott’s farcical “Direct Action” climate policy, which has no hope of reaching the government’s target of between 26 and 28 per cent reduction by 2030. Australia is relying on accounting tricks to meet its pathetically low reduction target of 5 per cent by 2020. Actual emissions will be up 4 per cent since 2000. But Australia can “carry over” credits from the previous period to 2012, because it got a special deal to allow an increase in emissions under the Kyoto treaty. The world has spent over 20 years discussing how to deal with climate change, beginning at the Earth Summit in Rio de Janeiro in 1992. But world leaders have consistently failed to take serious action. A great deal of hope was invested in talks at Copenhagen in 2009. But the summit was a total failure. No agreement was reached on emissions targets. This time individual countries are simply allowed to submit their own voluntary pledges. Officially, the conference aims to keep warming to an increase of 2oC, judged as the maximum safe limit. The planet is already half way to this target, with global temperatures 1oC higher than pre-industrial levels. Yet countries’ pledges to the summit would mean increases between 2.7 and 3oC. Environment Minister Greg Hunt thinks this isn’t a worry because, “we will probably come back every five years” to update the agreement. So, no rush then. Turnbull and the Liberals are too committed to the profits of the coal industry and securing cheap power for business to take serious action on climate. But tens of thousands took to the streets in the People’s Climate Marches across the country. Yet the rallies had no demands. The myth that Turnbull supports climate action went unchallenged and the door was open to Labor’s green-washing claim that emissions trading or the market can deliver renewable energy. It was an opportunity missed. 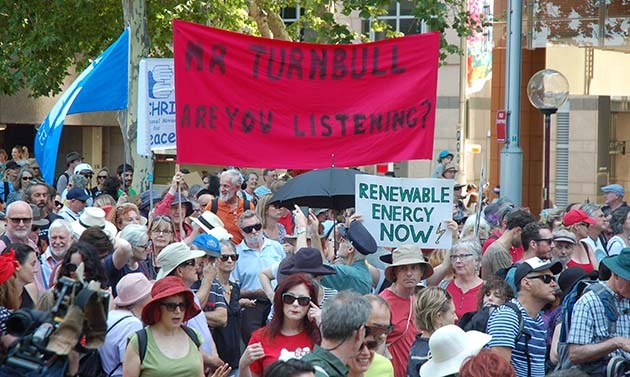 The mass climate rallies should have been the first blow against Turnbull’s determination to make the planet and workers pay for the profits of the big end of town. Turnbull is ahead in the polls because there has been too little fight and because Labor has been so pathetic. Labor’s proposal to slug workers with cigarette tax and its support for the Liberals making poorer uni students pay back Start Up Scholarships through a loan are just the latest examples. Public sector workers in the CPSU are also set to take further industrial action at airports against government demands to cuts conditions, taking $8000 a year from Customs workers’ pay. By re-igniting the “Your Rights At Work” rallies in the New Year, the ACTU could start a real fight against the GST and for union rights that could turn the tables on Turnbull. Building opposition to Turnbull’s Islamophobia, scapegoating of refugees, and ruling for the rich is just urgent as it was against Abbott.